My wife Mercedes and I had been ministering and traveling in Europe for two months already and were leaving the next day to Israel, our next stop on a round-the-world trip, where we had a very unique and powerful divine appointment take place as we came into the Holy Land. We were departing out of Athens, Greece and traveling to Tel Aviv, Israel when we were notified of a sudden flight change. Our original departure time of 8:00 a.m. was moved earlier to 4:00 a.m. that same morning (El Al Airlines often does this kind of thing to keep terrorists off track with their flights). We had to suddenly leave our hotel and spend the whole night at the airport, all the fun of a root canal without the drilling! But God had a plan in it all, even the miserable flight delay where we were stuck in the barren Athens airport all night long with nothing to do. That barren Athens airport posted two rules very clearly on signs all over: “No Smoking” and “No sleeping on the floor.” After hours of sitting around on hard plastic chairs that were designed just right as to make sleep impossible—some cruel, sadistic chair designer must have stayed up late nights designing and testing these awful sweat-producing beasts—a cement floor had never looked so good. It was like a cruel hoax, you can’t sleep in these horrid torture chairs and you’re not allowed to sleep on the floor, aagh! Finally I couldn’t take it anymore and took a look around and went down on the floor for some rest. I was almost asleep, when I felt a kick on my side. I looked up, and saw a soldier with a machine gun towering over me (Athens has long been notorious as a terrorists transit point and thus soldiers are constantly patrolling it). He apparently was there to enforce “some” of the rules as he puffed away on a cigarette and pointed at the sign about sleeping on the floor. “Doesn’t that sign say something about smoking too?” I was about to blurt out in my agitated, just pulled back from the brink of sleep, state. But a good rule of travel is not to argue with a soldier with a machine gun in a foreign country, so I buttoned my lip and got up. After some more hours of sweating and waiting around it was finally time to check in for our flight. We went over to the counter to now be abused by El Al Airlines, who must have taken interrogation lessons from the Mossad: You are guilty until proven innocent and must be exonerated before you can board their flight. They prod into every aspect of your life and what you are doing until they know more about you than you do! We had it coming hard at us, as we had been traveling for over two months already, all over every part of Europe, which set off red flags with them and they really gave us the third degree. Every part of our stuff was disassembled, every past ticket and place we’d been was checked out to see if it was true, question after question, it went on for almost two hours. They even went so far as to read Mercedes’ diary and then test her on it to see if it wasn’t just some fabricated fantasy made up by a terrorist who could finally get on board and blow up the plane. It was a crazy prayer because I didn’t even have a surfboard with me and the surf conditions in Israel, being that it is on the Mediterranean Sea, rarely get over one foot. But God is greater than our circumstances. We needed a battery recharge with some recreation involved after too many trains, planes and automobiles during our travels the past two months, and this night in the torture chamber of the Athen’s airport and the El Al grilling was the straw breaking the camels back. God knew our weariness and was about to answer in a miraculous way. We rented a car and were on our way out of the airport parking lot about to head straight toward Jerusalem to check into our youth hostel—the only thing in Jerusalem that would fit our missionary budget—and then go see some of the city, when, sensing an impression from the Holy Spirit, I suddenly pulled over and told Mercedes: “Listen, I believe the Holy Spirit is prompting us to go straight to the beach at Tel Aviv right now instead of going to Jerusalem.” It seemed kind of wild but she agreed we should step out on faith in what the Holy Spirit was leading. After that sign from God in the airport with the Endless Summer song it seemed like we should go for it and completely change our plans at the last moment, though we had no idea what, if anything, might be in store. We made our way toward Tel Aviv with the destination of Hilton Beach in mind, the one surf spot I had heard of in Israel. When we pulled up to Hilton Beach I was blown away by what I saw: peeling, 4- to 6-foot waves breaking right in front of my eyes in Israel! The flight delay had caused us to arrive in perfect time with a swell that had blown in from a storm in the Mediterranean Sea the night before. This was something miraculous in an of itself, as Israel rarely ever gets good surf, rarely even getting surf over one foot as previously mentioned. The only thing I needed now was a surfboard! I went around to a few surf shops in the area to see about renting a board but they wouldn’t rent surfboards. “You have to buy one for 800 dollars” was their answer “That’s twice as much as in the U.S. No thanks!” was my response, since there was no way I could afford that much money at that moment. I stood there lamenting my plight, now feeling tortured and disappointed; there’s nothing worse for a surfer than to see good waves right in front of him and not to be able to ride them, it’s like a dog on a chain who can’t reach far enough to eat a bowl of food in front of him. As I stood there salivating over the waves, but becoming increasingly bummed out that I wasn’t riding them, I noticed a small black Nissan Sentra with a young Israeli surfer guy in it pulling up next to me to check out the surf. As I began talking with him, I found out that he had just come back from a surf trip to California and had visited Huntington Beach, which is only 5 miles from where we lived in Newport. This was an amazing set of circumstances to meet an Israeli who had just come back from a town right next to ours in California; it caused us to hit it off immediately and we spent some time talking. He paused a moment and said that he normally doesn’t loan out his equipment, but then stated that he would make an exception today as he felt these were unique circumstances and that he could trust me. “Praise God! How miraculous it all was: This guy bringing an extra board like this when he never brings an extra one to the beach, then meeting him after being led right here by the Holy Spirit down to this beach in Tel Aviv, the fact that he had just returned from Huntington Beach, California, the music at the airport, the prayer on the plane, the change of the departure time by El Al Airlines that made us be right on time this morning for this divine appointment, and for the swell that just now hit, and it was all happening here in the Holy Land! After we were done surfing we went out to a really cool and very authentic Israeli restaurant. As we were sitting there enjoying our Israeli meal, I felt led to share the Gospel with him. He had the most flabbergasted response: “You are a normal person, you are a surfer, AND you are religious?” I explained that I wasn’t really religious, but that I just had a relationship with Jesus Christ. Living in Israel his whole life he associated religion with fanaticism and dour servitude to religious rituals, and thus was unprepared to meet someone who had an authentic relationship with God, yet still was normal and did fun things like going surfing and enjoying the beach. It was very apparent that surfing, and eating, and just hanging out with him and then naturally sharing the Gospel had had a major impact on him regarding the reality of who and what Jesus Christ and the Gospel are all about. We were able to spend time there that day with this young surfer guy and share the good news of Christ with him. 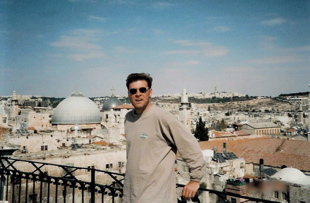 This is a person who in no way would have ever listened to a presentation of the Gospel in any other format whatsoever for he was a committed atheistic Jew who hated religion—not unlike so many in Israel, which a lot of American Christians are surprised to find when they visit the Holy Land on tours. The leading of the Holy Spirit had brought forth a divine appointment that helped us to recharge our batteries. I got to surf incredible waves in Israel of all places, while Mercedes got to enjoy the warm Mediterranean sun on the beach. More importantly however, was the fact that the seeds of the Gospel were effectively planted in the life of a closed-off, hard-hearted, religion-hating Jew who never, ever, would have listened to a thing anyone said about Christianity and salvation had I not first connected with him on a friendship level with surfing and having fun. He was so impressed he invited us to come to stay at his home if we came back through his area, something he said he doesn’t normally do. It was incredible to reflect at the end of it all how God used our airline change to bring me to exhaustion and cause me to pray to go surfing in Israel. That along with it causing us to come into Israel at just the right time when there was an unusual swell—swells in the Mediterranean are rare and only last one day because they’re so localized—which meant we came at just the exact right moment. To think how the music from Endless Summer played in the Airport terminal right as we walked through and then the Holy Spirit led us down to the beach in Tel Aviv where we had this incredible divine appointment with this young Israeli who just returned from California and “just happened” to bring two surfboards to the beach—something he never does. Then we got to surf together in some great Israeli waves, another miracle in itself. Then as we ate our Israeli lunch we had the glorious opportunity to effectively share the Gospel with him in a powerful way that touched his heart to the point where he was significantly impacted by the reality of the message. Not only were our own batteries recharged but our faith was incredibly buoyed by the miraculous outstretched hand of God in all these circumstances! It was an incredible divine appointment where God showed that not only does He work everything for good, but He also knows our hearts’ desires and prayers, and answers them in ways that work together to bless us and glorify Him and His name as we follow the leading of His powerful Holy Spirit. To God be the Glory!! !